Tag line: "Even the dead leave them"
The year: 1957. The location: The small town of Emerald. A school bus makes its way down the road in a rainstorm, loaded with children who pass the time by singing. Up ahead, their parents are parked on the other side of a railroad crossing, waiting for them to arrive. The bus approaches just as a train is speeding down the tracks. But the crossing malfunctions, leaving the driver oblivious of the danger she’s heading into. The parents, of course, see it, and scream for the bus to stop, but thanks to the heavy rain, their cries aren’t heard until it’s much too late, and the ensuing accident kills everyone on board. Cut to modern day: Melanie (Leah Pipes) and Crystal (Kristen Cavallari), two teenage sisters, are driving along the same stretch of road. Their family moved to Emerald a short time ago, but for Melanie, who's just been released from a drug rehab clinic, it’s her first day in town. Crystal tells Melanie all about the tragedy from years ago, as well as the urban legend that, if you park your car on the spot where the accident occurred and throw it into neutral, the spirits of the dead children will push you off the tracks, sometimes leaving fingerprints on the back of your car as they do so. The sisters laugh at how ludicrous it all sounds, with Crystal adding, “I hate to say it, but that accident is the only thing this town has going for it”. Yet, as they reach the crossing, Melanie notices a young girl (Sydnee Harlan), wearing a name tag that reads “Julie”, playing on the tracks. There’s something unusual about the way this girl is dressed, leaving a perplexed Melanie to wonder if the legend is true. Soon, her encounter with young Julie leads Melanie to start asking questions, including "What really happened on that rainy night in 1957"? 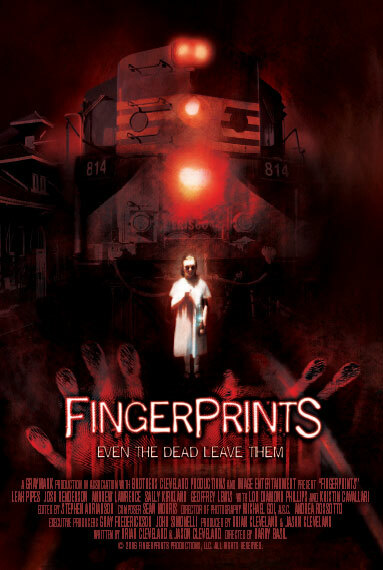 The opening scene of Fingerprints, which shows the accident that sets up this story, is skillfully constructed, and while we never actually see the impact, or witness the bloody carnage that followed, we at least experience it by way of rapid cuts, topsy-turvy camera angles, and the odd splash of blood hitting a window. It’s a solid sequence, as is a later one in which Melanie and Crystal are riding in a car with classmates Mitch (Andrew Lawrence) and Penn (Josh Henderson). Having just left a wild parry, a drunk Mitch decides to test the urban legend, and parks on the railroad tracks, going so far as to pour baby powder on his bumper so he can see the fingerprints after they've been pushed to safety. Things get hairy, however, when a train appears in the distance, and even though the others are screaming for him to start up the car and drive off, Mitch wants to wait for the ghosts to save them. As this is happening, Melanie sees Julie once again, standing on the tracks, and staring directly at her. Future run-ins with Julie only add to the film’s overall creepiness, a feeling that intensifies with each new encounter. Throw in a masked killer who’s going around town butchering people (in sometimes gory fashion), and you have the makings of an intense, fascinating thriller. With a story that combines the supernatural with elements of the slasher genre, and a strong performance by Leah Pipes holding it all together, Fingerprints proves an above-average indie horror film.